Mount Elgon is the shell of an ancient volcano. Its highest peak, Wagagai, reaches 4321 m, creating it the fourth highest peak in continent. Although a lot of erosion has taken place, after various years of abrasion the remaining oval formed volcanic crater currently measures roughly seven by eight kms, one among the biggest within the world. This 1145 sq. kms park shares its eastern border with Republic of Kenya .Mt Elgon is found within the eastern part of Uganda and sits by the Kenyan border district is the shell of an ancient volcano. The most attractions here are the waterfalls and caves that were once utilized by autochthonous folks, hot springs the mountainous vegetation, the varied peaks, suam gorge and the crater itself. 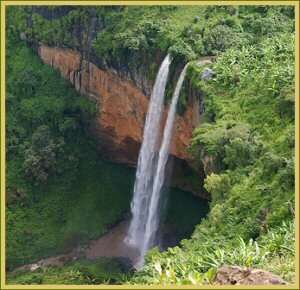 In the locality of Mt Elgon is the Sipi falls, Uganda’s most romantic and delightful water falls. It’s the proper place to relax and wander, exploring the various falls and caves. Excursions to climb Mgt Elgon to visit the rock painting or to travel rafting on the Nile River are natural extensions to a visit within the space. The Bagisu and therefore the Sabiny WHO observe circumcision every even year are the inhabitants of the area and can perform cultural dances upon request. June to August and Dec to March are the simplest times to go to the park since this is often the dry amount although you'll be able to additionally visit any season because it doesn't need any hiking equipment. The park contains varied peculiar attractions of natural elevation forests, bamboo, and big herbaceous plant, good species of flowers, birds, bushbucks, antelopes, wild cats, rock hyrax, hyenas, caves, craters, gorges, the impressive Sipi falls and plenty of additional.